Plans for a £250m project to extend Liverpool’s business district further north have been submitted for approval. Dubbed the ‘triple towers’ project, the scheme – by developer Elliot Group – includes three towers ranging in height from 27 to 39 storeys. The development will formally be referred to as the Infinity Project due to the endless views across Merseyside and into Wales that it delivers. “The design has evolved so that each block is now wrapped in two shimmering glazed skins that represent the sun reflecting off the undulating river. The blocks step up in height towards the business district and extend out dramatically over a podium with sculptured concrete columns. 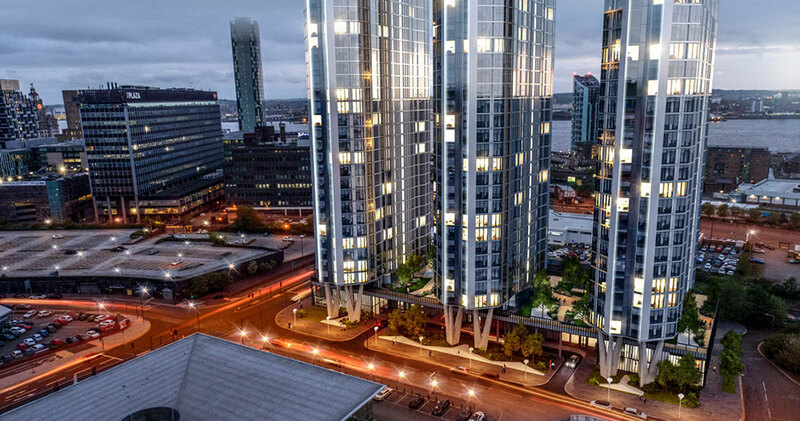 Encompassing over 1,000 apartments, the development will become the largest single housing project in Liverpool and the exciting plans also include for a luxury spa, gym and pool as well as 10,000 sq ft of commercial space. The planning application is likely to be concluded during the spring and whether or not the entire scheme will go ahead remains to be seen. Elliot Group, the developer, have however already held pre-planning meetings with Liverpool City Council and their, as well as the public’s perception, seem to be very positive. If the planning process ends with a green light, construction is likely to start on site in autumn of this year with completion following two years later in 2019. Major Specialist packages of work are anticipated to be out to tender on the Infinity Project by the Summer. Similar exciting projects across the UK are found on C-Link and Specialists are winning contracts daily on the platform.